The Southport War Memorial includes a 'Digger' statue and was originally erected to commemorate those who enlisted from Southport who served in World War One. An honour roll containing the names of those who served in World War Two was added at a later date. 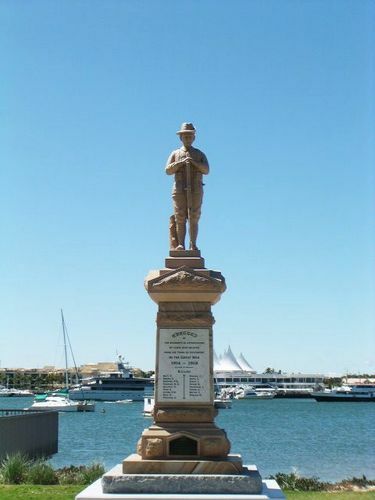 The redevelopment of the Southport Broadwater Parklands in 2010 necessitated the removal and relocation of the existing Southport War Memorial within the upgraded park. The memorial was cleaned, restored and re-erected by J.H. Wagner & Son. It was rededicated on the 11th November 2010. The war memorial erected by the residents of Southport and district was unveiled on the 25th April 1922 by Mr. J. C. Appel, MLA., in the presence of the largest gathering which has ever been seen in Southport. The site of the monument which stands 18ft. high and is built of Helidon freestone, is at the foot of Nerang Street. Four marble tablets, comprising the four sides of the base, are inscribed with the names of the men who enlisted from Southport and districts. The front tablet is reserved for those who made the supreme sacrifice. The base is surmounted by the figure of a soldier. The monument is flanked by two guns which were presented as war trophies to the Southport Council. The Brisbane Courier, 26th April 1922.